1. Determine what you are freezing and how it will be accessed. 2. Determine how much you plan to freeze. 3. Decide where the freezer is going to be located. 4. Decide on special features and options. The first step is to determine what kind of food you are putting into your commercial freezer and how that food will be accessed on a daily basis. Why is that so important? Think of ice cream, for example. 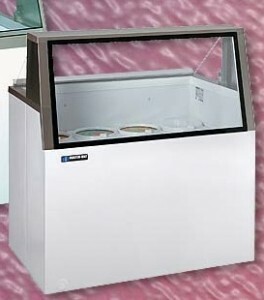 If you are freezing three-gallon tubs of ice cream that servers will access to make cones and sundaes, then you probably want a dipping cabinet. You wouldn’t want your servers going into a walk-in freezer every time they had to make a cone. A walk-in freezer is better used for bulk storage and backup. If you are retailing half gallons of ice cream at the front of the house, then a glass door merchandiser freezer might be your best bet. Make choices that will facilitate the flow of product throughout your establishment. The second step is to determine your ideal capacity requirements. There are few standards in the industry, so think about how much freezer space you need. Is a reach-in going to do it? Or do you need a walk-in? Are you serving a few flavors of ice cream only, or do you also have a full menu of entrees and sides that you purchase frozen? How often do you get deliveries? How much backup do you need? What about during your peak season? A little careful planning will help you make sure you have enough freezer space. The third step is to determine where the freezer will be located. Is the space large enough? If not, you might need to rethink your capacity requirements, your location choice, or both. Perhaps you need to “make” room for your freezer, or consider multiple units in more than one location. 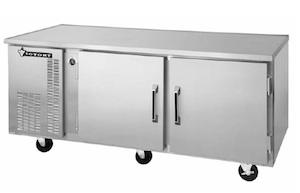 If space doesn’t allow for a traditional reach-in, would an under counter freezer work? Don’t forget to consider access to utilities. Finally, consider what special features or options you may need. Will your freezer require door locks for security? Do you need specialized shelving? Are pan slides instead of shelves a necessity? What about interior lighting? Would it be helpful to have a temperature monitoring system that triggers an alarm if the freezer cannot maintain temperature? Various manufacturers offer a host of special features and options that may be useful to you. Perhaps the best thing to remember is that most professional foodservice equipment dealers are happy to help you walk through the steps above. They will have product knowledge and experience helping buyers make the right decision. To explore your options, visit the websites of these freezer manufacturers: American Panel, Delfield, Master-Bilt, Nor-Lake, Thermalrite, Traulsen, True Manufacturing, Unified Brands – Randell, and Victory Refrigeration.